Republica Students writing their SEE exam at an examination center in Kathmandu on Thursday. 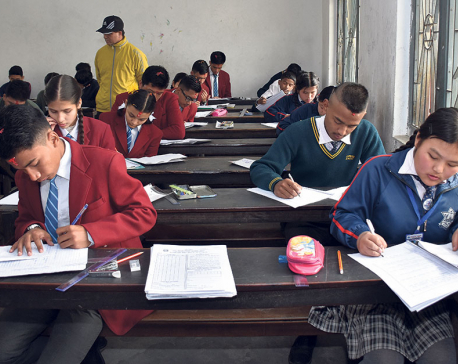 KATHMANDU, March 16: The Secondary Education Examination (SEE) for Grade 10, which was called the School Leaving Certificate (SLC) exams in the past, began across the country from Thursday. The exams are being conducted at 1,923 exam centers from 8 AM to 11AM till March 24. According to the National Examination Board (NEB), a total of 538,182 students including technical groups are sitting for the SEE. Among them, 468,400 are regular students, 50,873 partial grade promoters, and 18,909 exempted students from the past SLC exams. Of the total students appearing in the exams, 278,450 are girls while 259,732 are boys, according to the NEB records. A total of 464,743 regular students are from 9,834 schools. 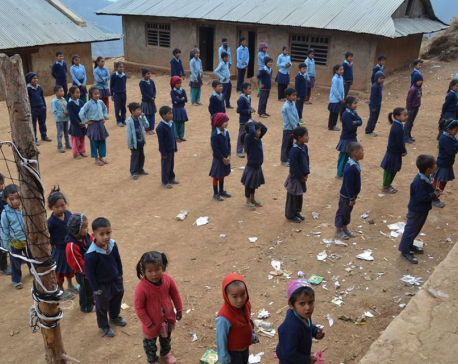 On the first day of the SEE on Thursday, the exam of English was held peacefully, said Hari Prasad Lamsal, spokesman for the Ministry of Education (MoE). The students who cheat in the exams or those who help them cheat will be fined up to Rs 100,000 or jailed for six months or both, according to the Office of the Controller of Examinations. It is the first exams for Grade 10 at the regional level after the implementation of the eighth amendment to the Education Act 10 months ago. The Education Act has provisioned the SLC exams to be held in Grade 12 as the School Leaving Certificate Examination (SLCE). The SEE is being conducted in the five development regions, with a different set of questions for each region. It is the second time that the letter grading evaluation system is being practiced in Grade 10. According to the MoE, the letter grading system will be gradually enforced in school level exams from Grade 0 to 12. The system is being implemented in Grades 9 and 11 from this year.